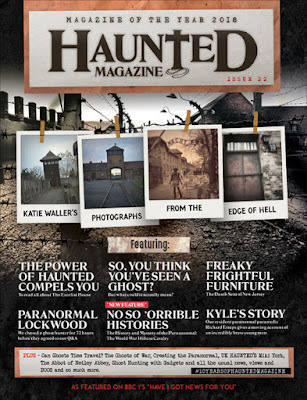 Haunted Magazine: HELP US!! Our Facebook page is being kidnapped by a Paranormal Team!! 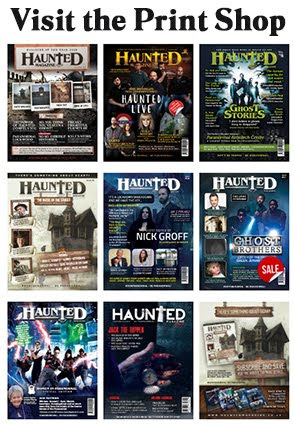 Here at Haunted Magazine, we've been called many things, some of which are not repeatable in case children are nearby but we are also known for many things, being different is one of them, when I had the idea for Haunted Magazine the whole mandate was to "be different" not to be a replica of The Fortean Times or to be all science and techie based. 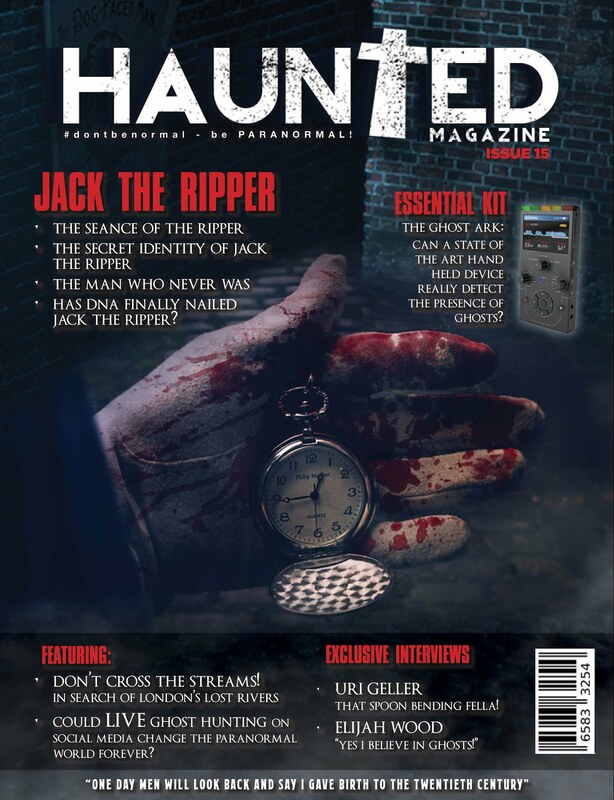 Back in 2003 (when the idea was first ignited) Haunted Magazine's intention was (and still is) to be a magazine of the people in the paranormal, for the people who love the paranormal and by the people who love the paranormal. 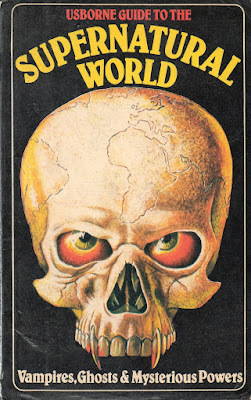 Eye catching front covers, clever tag-lines, subtle headlines segued with paranormal features that were retro, were current, were clever and were readable, informative yet entertaining. 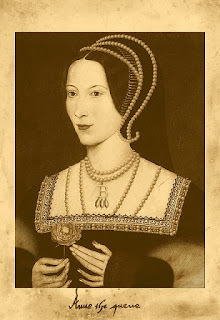 It's true to say that when the very first issue of Haunted came out (in August 2009) you could probably count the number of paranormal groups on your fingers, actually Anne Boleyn could definitely count the number of paranormal groups on her fingers. And then along came Mr. Social and Mrs. Media and the paranormal world exploded into what it is today AND LONG MAY IT CONTINUE!! Who are these 3 Girls in the photo? 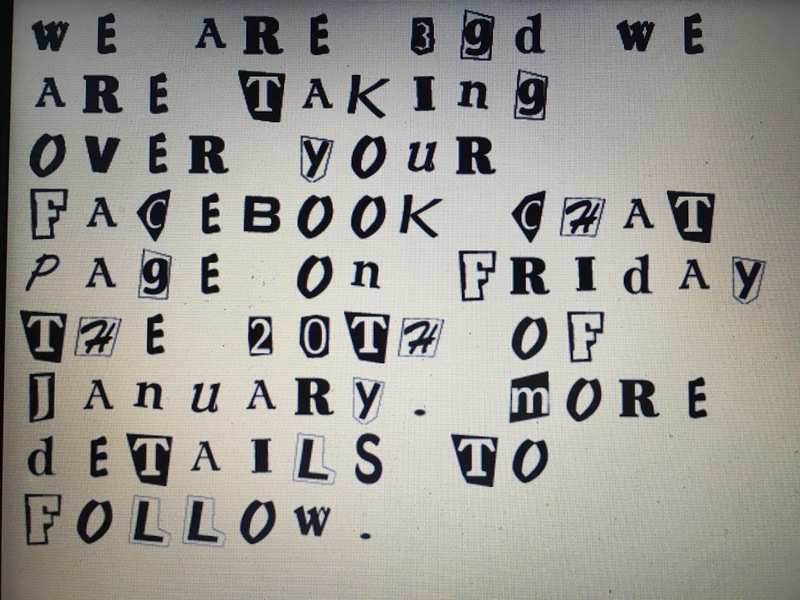 This Friday, the 20th of January we are taking social media to a whole new level, we are talking a whole new ball game, OUR CHAT PAGE IS BEING KIDNAPPED AND TAKEN OVER!! 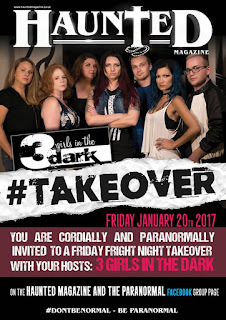 That's right we are being held to ransom by another paranormal group who have threatened to cut the A from our name IF people don't listen to them on Friday, don't engage in conversations with them, don't answer their questions. 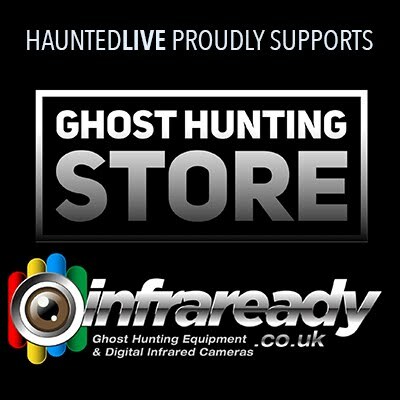 People of the paranormal world PLEASE LISTEN TO THEIR DEMANDS and oblige accordingly, we don't want to be known as HUNTED. So, who are they? 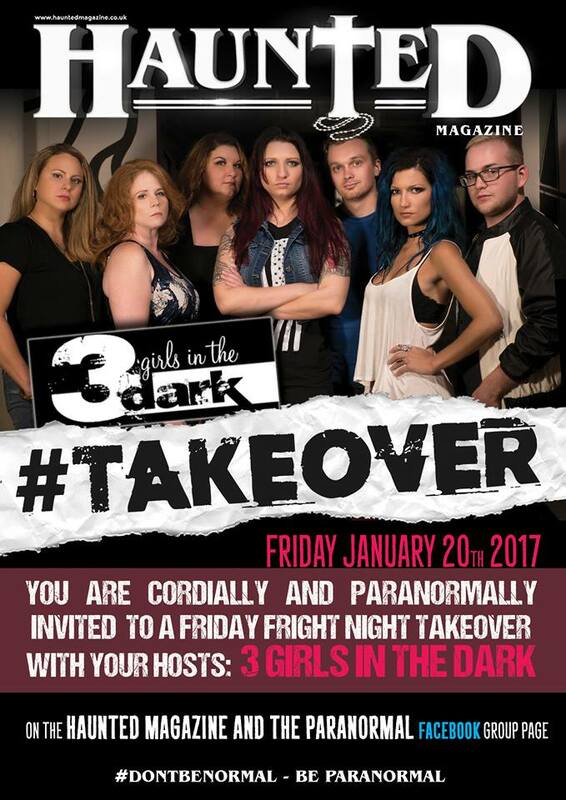 3 Girls in the Dark, that's who, but don't be fooled by the name there's actually 7 of them and they're not all girls, how sneaky and confusing is that? All we know about them is that each member of 3GD have been into the paranormal and all things weird since childhood. 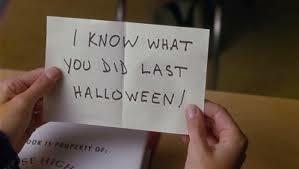 record breaking Halloween viewing figures, surely? It all started a few weeks ago when we received this letter, we just thought it was a fan letter at first, because we knew what we did last Halloween too, we were at 30 East Drive, doing a 4 hour #Haun7edLIVE facebook live broadcast reaching over 1.8 million people. Nothing strange there or so we thought. Then a couple of days later we received another letter and it all started to get a bit freaky and it wasn't even a friday. record breaking #Haun7edLIVE viewing figures, surely? 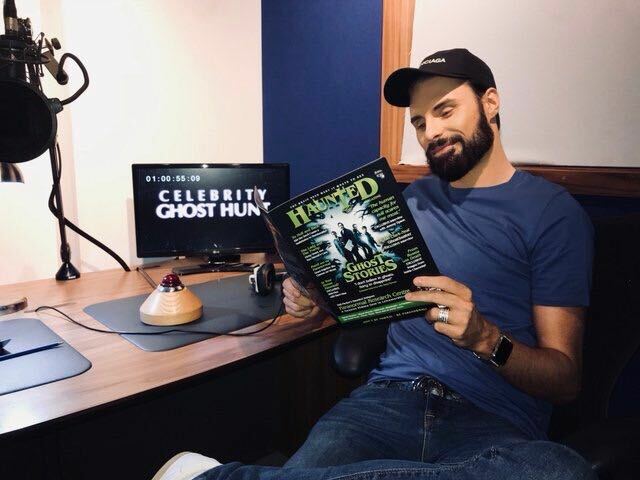 Some of the girls in the Haunted office said they kept seeing a strange man speaking in a weird language in the office, we just laughed it off and said "don't be silly, that's just Coxy from #Haun7edLIVE". 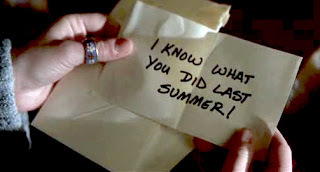 The second letter said "I know what you did last Summer!". Fair enough, we knew too, we were at Silverhill Pit, a disused colliery where over 1 million people viewed our live investigation there. But then something happened which really freaked us out. 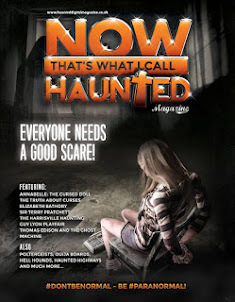 We received something in the post which chilled us to the bone, no it wasn't Most Haunted series 20 on DVD, it was far worse than that. It was a letter made which spelt out clearly who they were, what they were going to do and when they were going to do it. It was so bad, so shocking that we haven't seen our spell-checker guy since, so when Issue 17 of Haunted comes out, please forgive us. 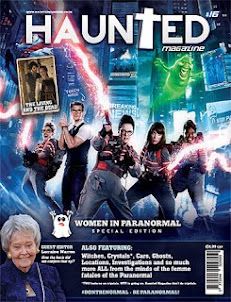 By now it was getting a little jittery in HMHQ (Haunted Magazine Head Quarters) as you can imagine. The cleaning lady hasn't been in for ages, we've got pixelated dust gathering in the corners and my collection of victorian ectoplasm has mould appearing on it. and most importantly off all DON'T LET THEM CHOP THE A from HAUNTED OFF!! !